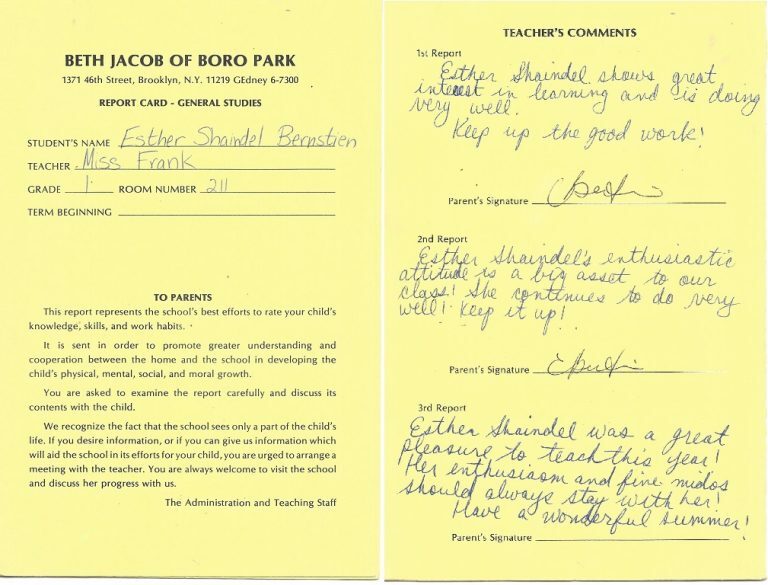 What can a few simple report cards tell us about Bais Yaakov schools? One of the purposes of the Bais Yaakov Project website is to foster scholarship of the Bais Yaakov movement – its beginnings, its development, and its current character(s). We collect documents that might seem insignificant at first glance, because researchers can often find significance in the smallest and most banal of items. Sometimes, an item from the archives is interesting for a tidbit of information it reveals, like the intriguing epigraph from Eleanor Roosevelt on a document from the Central Office of Bais Yaakov that helps us understand the role of Bais Yaakov in a broader context. And sometimes, an item becomes fascinating when compared with other similar items. What are the subjects listed on the report card? Which subjects are given a grade? Are any left blank? Are the subjects all academic, or are non-academic areas given grades as well? What is the grading system on the report card? Are attendance and lateness marked? Does the report card indicate parental involvement? Does the report card provide room for comments apart from grading? Is the school year divided into quarters or semesters, etc.? All of these questions can help us understand how a specific school functioned, what its mission was, and how its function matched its mission. We can also ask the same questions about report cards from multiple Bais Yaakov schools and multiple time periods. That way, we can build up a data set which we can use for comparisons of various kinds. We can, for example, compare how Bais Yaakov elementary schools versus Bais Yaakov high schools operate, what subjects and areas they stress, how much parental involvement and student responsibility is expected, etc. We can also compare schools from different geographic areas, asking how Bais Yaakov schools differ from Europe to North America to Israel, or how Bais Yaakov schools in different American cities compare (Brooklyn, Lakewood, Baltimore, “out-of-town,” etc.). All of these comparisons become significant when we have a bulk of data to compare. The Bais Yaakov Project currently has report cards from only a few individuals, so it’s harder to do a comprehensive survey. But we can compare two similar report cards from two very different eras – Yocheved Halpern’s Grade 1 report card from Bais Yaakov of Rzeszów, Poland, in 1935; and Esther Shaindel Bernstein’s Grade 1 report card from Bais Yaakov of Boro Park, New York, in 1995. 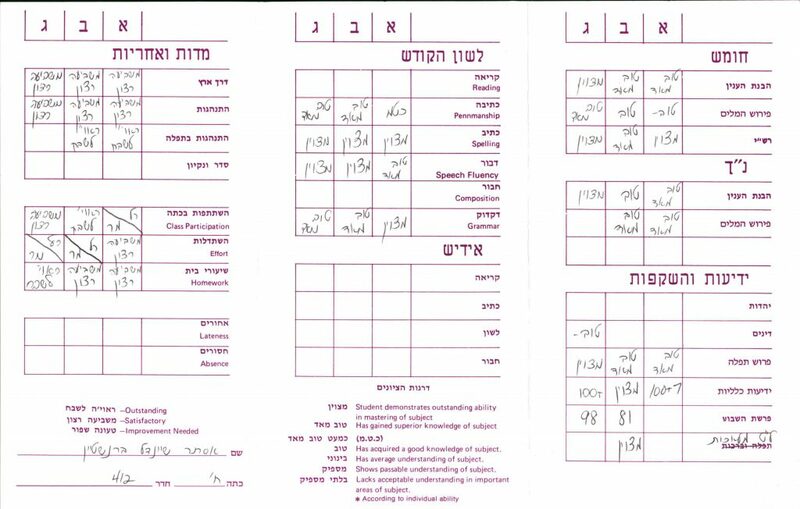 By comparing these two report cards from Bais Yaakov schools separated from each other by 60 years, we can take a preliminary look at how Bais Yaakov changed – or didn’t – over the course of its development. The very familiarity of the report card shouldn’t obscure the fact of just how innovative the report card was (along with the innovativeness of Bais Yaakov, more generally). Yeshivas and heders didn’t have report cards, and it was a sign of Bais Yaakov’s “modernity” and professionalism that it divided the school day into regular subjects, had a formal curriculum that all Bais Yaakovs were supposed to follow, and had a standardized grading system. These seem to have been borrowed from the Samson Raphael Hirsch schools, which had similar innovations. 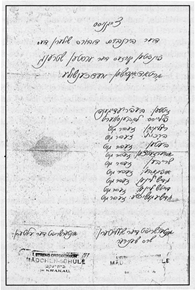 But apparently Sarah Schenirer herself did not wait for the arrival of German administrators to introduce report cards, since we have a very early one, handwritten and with Schenirer’s signature, for one of her first students, Devorah Teitelbaum. 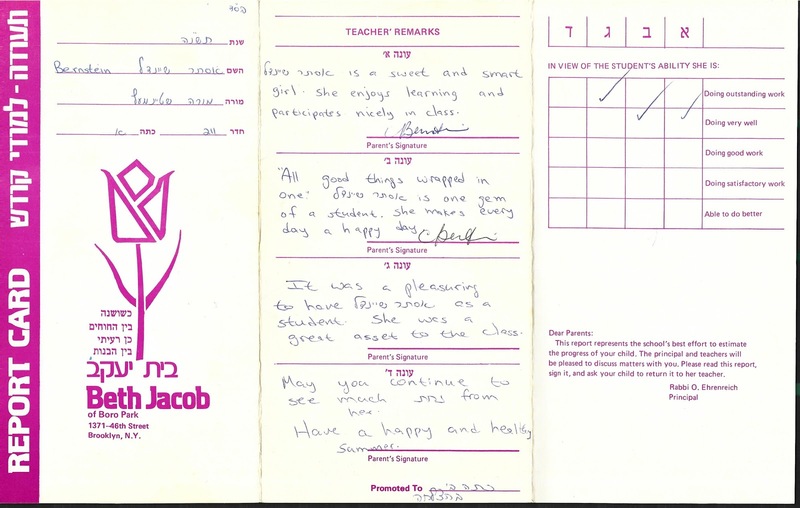 Report card of Devorah Teitelbaum, an early student of Sarah Schenirer. Below you’ll find images and transcripts of the two report cards: Yocheved Halpern‘s report card from 1935 Poland, and Esther Shaindel Bernstein‘s report card from 1995 Brooklyn. Following the transcription, we’ve sketched out a few significant details. There is a lot more to be said about these report cards themselves, and even more to be said when we have more report cards to add to the study! 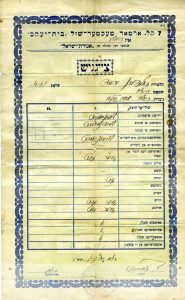 We hope this rough study demonstrates the vast information stored in archival documents of Bais Yaakov. Term 1: Esther Shaindel is a sweet and smart girl. She enjoys learning and participates nicely in class. Term 2: “All good things wrapped in one.” Esther Shaindel is one gem of a student. She makes every day a happy day. Term 3: (spills over into the space for Term 4) It was a pleasuring [sic] to have Esther Shaindel as a student. She was a great asset to the class. May you continue to see much nachas from her. Have a happy and healthy summer. However, those subjects are broken down into more components in the 1995 Bais Yaakov of Boro Park report card. The categories of behavior also differ, as does their placement in the report card: the 1935 Rzeszów report card lists attitudes and interest in studies before the studies themselves, while the 1995 Boro Park report card lists behavior and responsibilities after the studies. This difference is open to interpretation and could indicate a number of things. One possibility is that the Bais Yaakov of Rzeszów in 1935 valued the attitudes more than the studies, and vice versa for the Bais Yaakov of Boro Park in 1995. That is impossible to say conclusively with only one document from each school, however. Another significant difference is that the 1995 Boro Park report card is accompanied by another report card for secular studies. This can be understood within the context of how Bais Yaakov started – as a supplementary program which students attended in addition to their state-mandated schools – and how most Bais Yaakov schools exist today – as fully self-contained educational institutions providing both Jewish education and state-mandated education. On the other hand, there was a full-program Bais Yaakov in Rzeszów and it is possible that the report card we have was accompanied by a secular report card that did not survive. 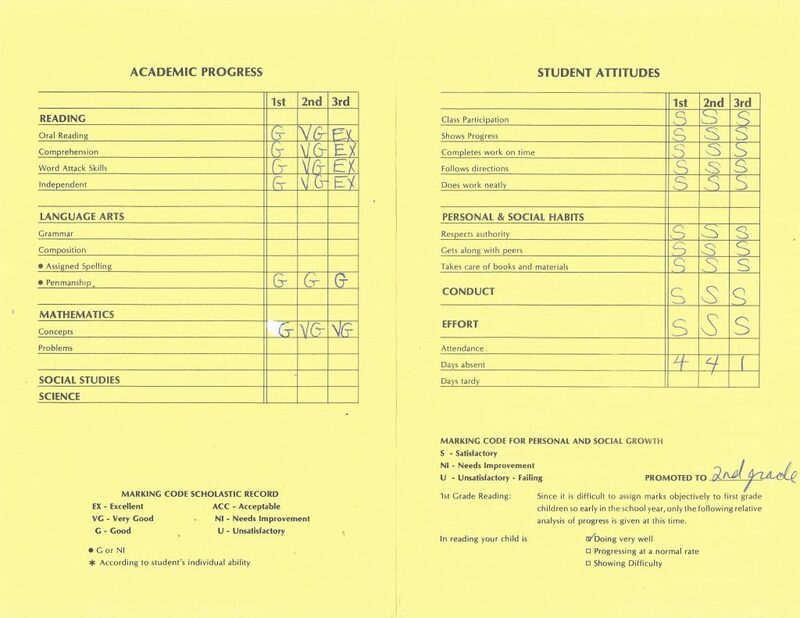 The separation of an individual student’s grades into two separate report cards – one for Jewish studies and one for secular studies – is an indication of the school’s attitudes toward the way Judaism and secular knowledge interact. 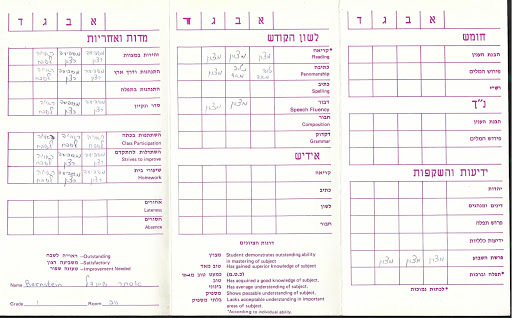 If we had report cards from other Bais Yaakov schools in 1990-2000 or so, we could ask whether all Bais Yaakov schools separate their curriculum in this way, whether some combine them into a single report card, and what distinguishes the schools who follow one method from schools who follow the other. 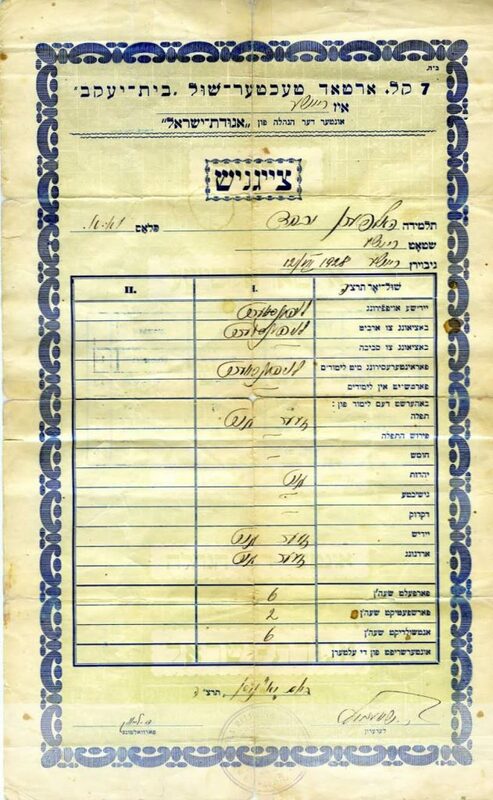 Our hope is that Bais Yaakov graduates will loan us their report cards or report cards from their family archives. If we can enrich our collection, we open up the possibility for comparison across time, location, age, and other features of Bais Yaakov schools, gaining a richer understanding of the development of the Bais Yaakov movement. If you would like to lend your Bais Yaakov materials, or materials from your family collection, please contact us. All materials will be handled with utmost care and returned to you after digitization. Names can be removed from documents, and all addresses and phone numbers will be redacted from documents published to the website.